On Sunday, Apple's original iPod celebrated the 15th anniversary of its launch on October 23, 2001. The reveal of the iPod by former Apple CEO Steve Jobs in 2001 was preceded by the usual breadcrumb trail of mystery, rumors, and leaks, with most reports pointing to a new "breakthrough digital device" coming from the company later in the month. Apple even hinted itself that "it's not a Mac." Some speculation went against rumors that the device would be an MP3 player, even suggesting it could be "something more sophisticated such as a component for a home digital stereo system." Still, most reports pointed toward the impending launch of the "iPod," a device that would allow customers to ditch their cumbersome CD players and listen to thousands of songs from one device in their pocket. In the official keynote address, Jobs referred to the Mac as the focal point of the Apple customer's digital lifestyle, with the new iPod device as the ultra-portable, music-enabled addition to that lifestyle. The iPod launched for $399 with a 5GB hard drive that could hold up to 1,000 songs, a 10-hour battery life, a black and white LCD screen, came equipped with FireWire to enable a connection between it and iTunes on a Mac, and was the size of a deck of cards (2.4" wide, 4" tall, 3/4" thick). A few individuals who were part of the iPod's launch looked back at the device over the weekend, although Apple itself remained silent on the topic. In the first official promotional video for the iPod, a collection of Apple executives and musicians -- including Phil Schiller, Jony Ive, and Moby -- are seen discussing the creation and impact of the device. Speaking with Entertainment Weekly, Moby remembers "how magical it was," and remarks on how much has changed with the iPod, and its successor in the iPhone, in 15 years. 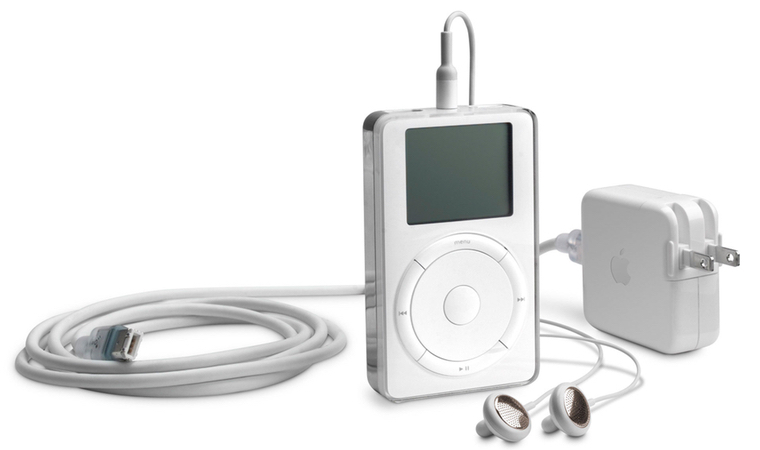 The first alternative iPod lineup, dubbed the iPod mini, debuted in 2004, followed by the iPod nano and iPod shuffle in 2005. The iPod touch was eventually introduced as a non-cellular counterpart to the company's iPhone, and became one of the longest-lasting iPod lines to date (six generations), tied with the classic line, but behind the iPod nano (seven generations). In 2016, Apple still manufactures and sells the iPod touch, iPod nano, and iPod shuffle, but the three devices have long been removed from the main toolbar navigation on its website, and are now located under "Music." The three current iPods on sale bear little resemblance to the original device's famous click wheel interface, which was mechanical in the first generation and touch-sensitive in subsequent lines. The last iPod with a click wheel, the iPod Classic, was discontinued by Apple in 2014 and marked the sixth generation of the device. The iPod began Apple's quest to make music a mainstay in its customers' lives by finding a seamless and effortless way for songs to be carried around, in opposition to the size of CD players and the general confusion at the time over how other MP3 players worked. Today, music is a bigger part of Apple than ever, with Apple Music slowly growing in subscribers and the iPhone now essentially the modern version of the original 5GB iPod from fifteen years ago. This week at a Mac-focused event, it's also expected that the company will debut the wireless "AirPods." The Bluetooth device will be the newest implementation of its ubiquitous headphone line, which began alongside the iPod in 2001. I thought the iPod would never catch on because you couldn't record onto it. Minidisc was here to stay. "Apple should get back to making computers." "Urgh, no iMac update? Who cares about an MP3 player." "This product will be dead within 2 years. Guaranteed." God bless the Internet. Great to look back and see how biblically wrong people were. There's a reason they're known as armchair CEOs. I know that Mac-only compatibility is just one of the things that people will complain about in reference to this device. But the naysayers have it wrong, and I'll tell you why: The iPod is revolutionary in a number of ways, and its descendents will replace the PC. Can we say that whining on Macrumors is also 15 years old? Or did it even pre-date the iPod introduction? I remember seeing this in the magazines as a kid and I was drooling. I thought to myself that this is the ultimate MP3 player. Then I got the updated 10GB touch wheel version for Christmas and this changed my life in so many ways. I became immersed in music. I listened to music everywhere, all the time. I started to become a music geek and it I am totally thankful to iPod for those endless hours of beats, raps, synths and guitars. Music is everywhere now at our fingertips, but the iPod was the first to make this world a reality. Thanks Apple! Also thanks for making me cool as f*** in middle school. BTW: I still have that first iPod of course. I still have mine, and it still works, though it doesn't really hold a charge (can get a new battery if I wanted). Controversial at the time, but no controversy that it launched Apple to what it is today. And we still hear the same tired things today. As I've said before, if the MR community ran Apple they'd burn through that cash pile and be bankrupt pretty quickly. It's a shame too as there are many good members here and they're often buried under the noise. I never ended up buying an iPod (aside from a 4th Gen Nano I found in a property I purchased). But it's easy to see that they're an important part of the history of Apple, what a huge impact they had.